If you are looking for a black and white photograph for your home or office, consider us, we offer a wide selection of black and white photographs of Chicago. 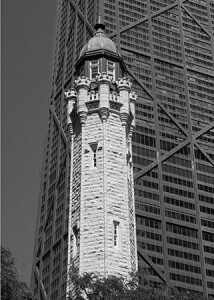 The Chicago Water Tower is one of the very few structures that remained standing after the great Chicago Fire in 1871. At 154 feet, it stands as a dire reminder of the event. The Tower is located at 806 North Michigan Avenue along the Magnificent Mile shopping district in North Chicago. The tower was built in 1869 by architect William W. Boyington from Joliet limestone for housing a 138 foot tall standpipe, which helped with water flow and pressure for the pumping station. The tower underwent a renovation from 1913 to 1916 to replace its limestone blocks. Another renovation occurred in 1978 for interior changes and minor exterior changes. The Tower was named an American Water Landmark in 1969. While it still serves its original use since 1911, it is also popular tourist attraction in Chicago. Now the Water Tower is the City Gallery, which holds Chicago-themed photography exhibitions by Chicago photographers. There is also a Visitor’s Information Center with free information about Chicago’s attractions. The Water Tower remains the second-oldest water tower in the United States. If you are interested in acquiring these photographs, follow this link, Vintage Chicago Photography, for more information on these photographs and more.